With Customer Engagement, you can use the right storage option for the right situation. For example, you can store your private documents by using the new OneDrive for Business option. For collaborative storage, you can use Office 365 Groups and for public documents use SharePoint. You might use OneDrive for Business to start and work on a document privately, such as for a draft sales pitch. When the draft is far enough along, move it to an Office 365 group for team collaboration. You have lots of storage space (1 TB or more) with OneDrive for Business, and documents stored there are automatically synced to your desktop and mobile devices. 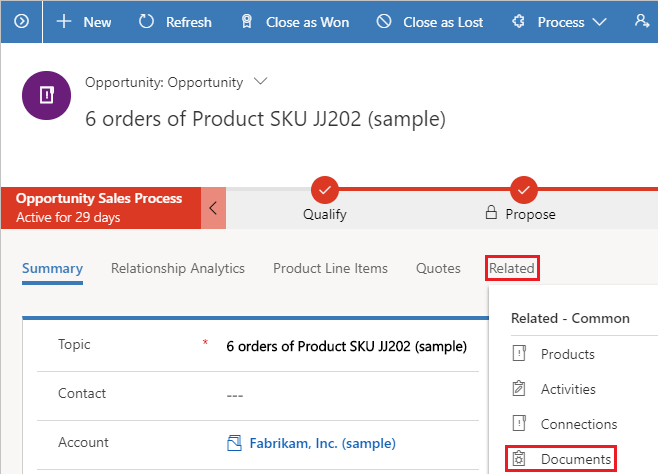 For example, if you put a presentation in Customer Engagement that's stored on OneDrive linked with an opportunity, that presentation is synced to all devices running OneDrive. This feature requires that you have an Office 365 subscription or a subscription to an online service such as SharePoint Online or Exchange Online. For more information, see What is Office 365 and how does it relate to Dynamics 365 (online)? Go to the record for which you want to view the associated documents. For example, select Sales > Leads. If you're using the web app, on the command bar, select the down arrow beside the record name, and then select Documents. If you're using a mobile-optimized app, select the Related tab, and then select Documents. After OneDrive for Business is enabled, you'll see the following dialog box when you go to the Document Associated Grid to view documents in Customer Engagement and upload a file to OneDrive, or when you attempt to create a new document or folder. Select Change folder location to pick a new location to store OneDrive documents, or select Continue to accept the default folder location: \Dynamics365. The default folder location is set to \CRM for users who haven't upgraded to the Dynamics 365 for Customer Engagement apps version 9.0. Open the Document Associated Grid. The following example is for Opportunities, but works the same for all record types. Choose an opportunity from the drop-down menu, and then select Documents. 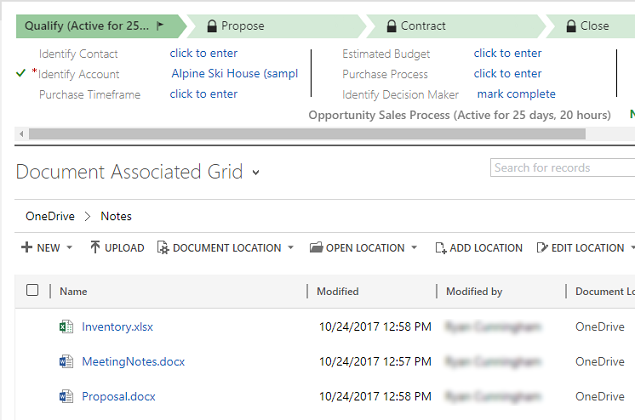 Customer Engagement now organizes documents in a consolidated view. Select Document Location to filter the document list. Go to the Document Associated Grid. Select Document Location, and change the location to OneDrive. Select New, and then choose a document type such as PowerPoint or Word. Enter a document name, and then select Save. The document is created and opened in the Office 365 Online application. If you're are using the mobile-optimized app on tablets and phones, the document is opened within the Office app such as PowerPoint or Word. You can change the location of your OneDrive documents and rename the folder used for OneDrive. Select Settings > Document Management > OneDrive for Business Folder Settings. Enter a new location for Customer Engagement to store OneDrive files, and then select OK. The OneDrive folder is renamed, and all existing files will now be associated with the new folder. OneDrive storage folders are created in the user's current Customer Engagement language. If the language changes, new folders will be created in the new language. Old folders will remain in the previous language. There may be a delay between when the documents are shared in OneDrive and when they're available to other users.